My new iOS Match 4 Emojis game is done! This is a fun game where you match up four emojis in a row. It’s a ton of fun and I have allot of fun putting this game together. I think it’s my best game I have done yet! 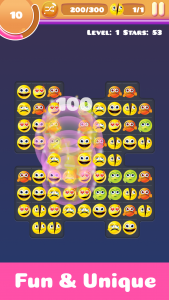 Match four Emojis is a fun game where you try to match 4 emojis in a row. Even though the game sounds simple, it’s very challenging with many different types of levels and worlds. Some levels are timed with as many moves as you want and others count your moves as you try to accomplish the mission. It’s a ton of fun and very addicting! Download and play now for free and let’s start matching those Emojis! Download & Play For Free Now! Thanks Eric. Keep up your good work on the The Daily Overpass videos!